I like books that make me think. Word games, word play, riddles, trivia, sudoko, memory games, etc. Over the years I've owned several and I've gone through them so quickly because not all of them are full of really hard challenges. 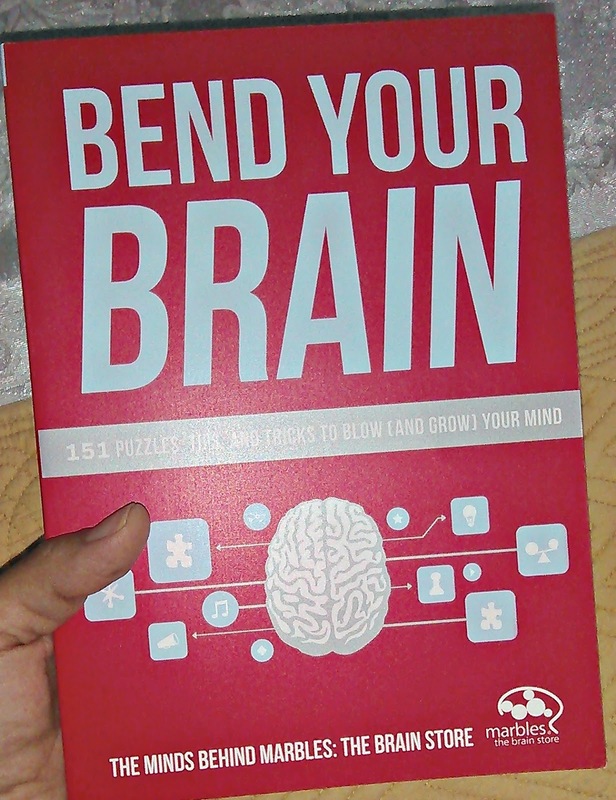 The latest book that really challenged my brain was Bend Your Brain. Want to get your frontal cortex breaking a sweat? Make your blood pump to your cerebellum? Stretch your occipital lobe to its limits?Then you need to bend your brain! This first book from the team behind Marbles: The Brain Store, a chain devoted to building better brains, offers puzzles and brain teasers to help enhance memory, build problem-solving skills, and reduce stress. Since Marbles started helping people play their way to a healthier brain, they've sold, solved, and been stumped by more than their fair share of puzzles. Along the way, they've learned which puzzles tie people in knots (not in a good way) and which ones make the neurons downright giddy. With the help of their in-house team of BrainCoaches and access to cutting-edge neuroscience, they've designed these puzzles to keep your mind flexible and fit. This book arrived at my house and I couldn't wait to open it up and start writing. I got through the first few pages, and thought, "Not too bad, but really not that difficult...I'll be completing this book in no time!" I was more wrong than ever. This book is not super easy at all. It has made me think harder than any of the other brain game books that I have ever bought. I have actually found myself taking over an hour to complete some pages, which is not like me, and I even had to give up and try a new page at times. Yes, I could have just gone to the back of the book and looked at the answers, but I, personally, hate to do that. I like to complete these kinds of books without any outside help. What I do when I give up on a page is go to a new one and then come back to the page on a different day. Sometimes this makes it easier, sometimes I end up still not knowing the answers and start a new page again. I love how difficult SEVERAL of the pages are! I have been taking this book with me in the car when I'm being driven around, to appointments, while I'm lying in bed, when I'm bored, when I can't sleep, and etc. I try to work on a few problems or games every single day. I'm trying to keep my mind fresh and healthy and young. This book is great. I think this book is a lot of fun and a wonderful way to sharpen your mind.